August 8th 2012. 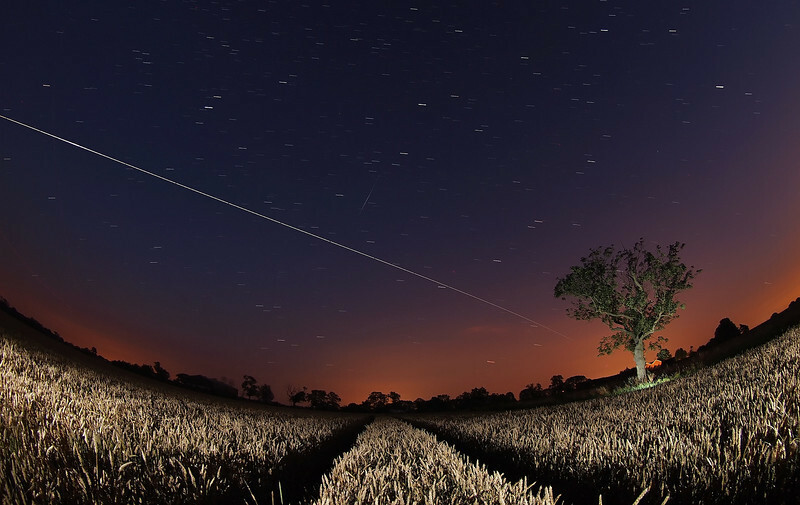 Summer ISS passes are back over UK evening skies & what a sight to kick them off. A rare clear sky evening and the 2207hrs flyby moving from the SW to E skies was a super bright event. I selected a nearby corn field which provided a great foreground composition. Lit with some remote flash bursts. Note the Iridium Flare 11 in the middle of image just above the ISS trail. It nearly intersected :-) Captured with Oly E5, 8mm fisheye. Numerous 15s exposures, F3.5 and composite stacked with StarStax software.